UnitedHealth Group (NYSE: UNH), the largest health insurer in the U.S., operates two primary segments – UnitedHealthcare and Optum. UnitedHealthcare includes health insurance plans provided to employers & individuals, and community solutions such as Medicaid and children’s health insurance, while the Optum segment covers services such as pharmacy benefits management (PBM) and health care services. The Optum segment, driven by the success of the OptumRx business, has been the standout performer for the company over the last few years, but this could change given the rise of the Medicare & Retirement business (which is part of the UnitedHealthcare segment). 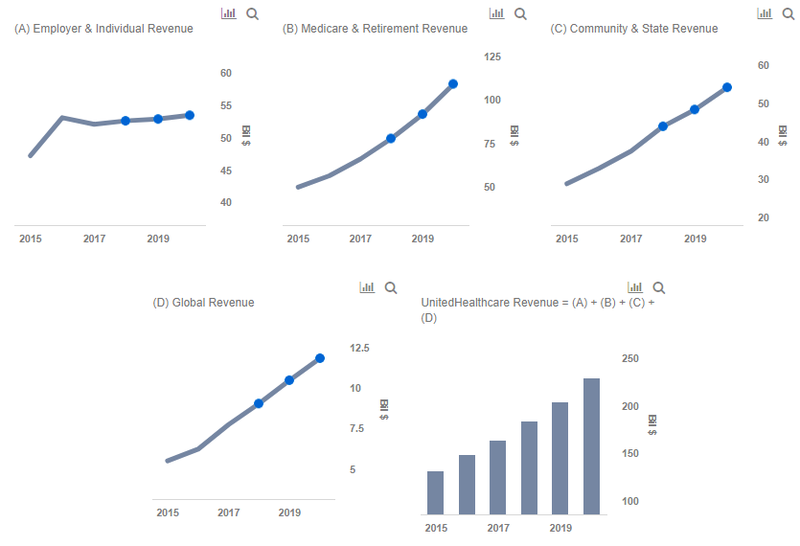 We have created an interactive dashboard analysis of UnitedHealth’s revenue growth that shows how much of the company’s future growth is likely to come from its Medicare & Retirement business. You can adjust the revenue and margin drivers to see the impact on the overall revenues and earnings from operations. UNH’s Medicare & Retirement business includes health coverage and services primarily to individuals aged 50 and over. The number of people that the company serves via public and senior plans has been on a strong run for a while now, and we expect this trend to continue in the near term as the population of Medicare beneficiaries is slated to grow in the coming years. Meanwhile, the company is in the process of acquiring Louisiana-based Medicare Advantage plan Peoples Health, which will add about 63,000 customers and generate additional revenues. Per PWC, Medicare Advantage will cover about 21 million people in 2018, on the back of baby boomers reaching the age of 65. Given the potential for growth, competition among health insurers is heating up, and an important factor that can tip the scales in an insurer’s favor is customer engagement. This is where UnitedHealth’s digital services, call advocates, consumer-centric benefit designs, and nurse coaches stand out. As evidenced by the above charts, the Medicare & Retirement business is likely to contribute significantly to UnitedHealthcare’s growth in the next few years. The company is actively trying to deepen its penetration in the markets where opportunities are available, which could drive further growth over the long run.